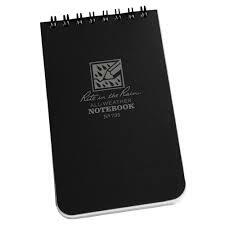 Get a Secret Squirrel All Weather Notebook for secret notes. The Secret Squirrel All Weather Notebook is actually the Rite in the Rain Notebook No. 735. Water Proof and Sweat Proof. 50 Pages...or 100 sides however you want to count it. Horizontal lines like most notebooks but has faint vertical lines for accurately drawing out grids, buildings, etc. Free Shipping US, FPO, APO! Ideal for LE, EP and anyone else that needs to take notes and not throw your uniform requirements out of whack. If you don't write it down, it didn't happen! Make sure you get the notes you need descretely.